Neutropenic sepsis is a potentially life-threatening complication of chemotherapy and has an associated mortality of 2% to 21%. Patients can deteriorate rapidly and are usually advised to attend their local emergency department (ED) for urgent assessment and antibiotic therapy within one hour of arrival. Delivery of this emergency care is, however, inconsistent, and at times suboptimal, due to a lack of awareness of the condition and of clinical expertise. 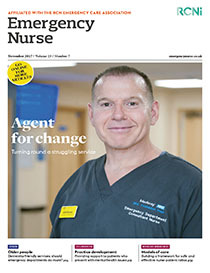 This article discusses a collaborative project between an acute oncology service and an ED, which has improved and sustained compliance with this standard through a range of initiatives, including revised and integrated sepsis guidelines, education, sepsis champions and a fast-track patient pathway. A transformational leadership approach, which embraced collaborative working and fostered motivation by creating ownership of the project by the ED team, has been instrumental in its success.